Tamriel is divided into zones for Elder Scrolls Online. These zones appear much like regions or holds, but cross traditional provincial borders. The zones are divided by Alliance, with five to each (at launch) as well as one or two starter zones, and these zones are further divided into three Subzones each. 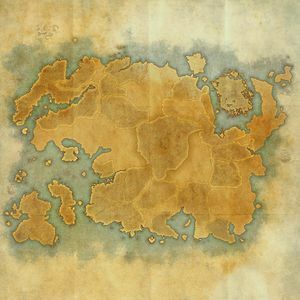 Cyrodiil is one zone, much larger than the others, divided into three larger-than-normal subzones. There are also a number of zones which, while nominally located within an Alliance's territory in some instances, are considered politically neutral. Prior to One Tamriel, zone content was geared to specific player levels according to the table below. Note that levels 1-2 were encountered only in the tutorial dungeon, the Wailing Prison; characters that skip the tutorial start at level 3. The tiered ordering of zones remains important for story progression, but the level banding no longer exists, as all zones are subject to the Battle Leveling system that previously only existed in Cyrodiil and DLC zones. As well as originally being a Veteran-only zone, Craglorn was first released as an Adventure Zone, a retired subset of zones which contained content solely aimed at groups of four players. This page was last modified on 13 January 2019, at 21:46.